Besides, at this point artificial gravity doesn't seem to be a goal for the DSG, especially since the notional missions all seem to be short duration ones, meaning zero G won't be a big problem for missions to our Moon. People are about 2 m tall so splitting the DSH down the middle into two 4m high modules should work. Expand a truss to separate the two modules. NASA has developed trusses that expand. I'm not able to imagine what you're suggesting, but keep in mind that once you start rotating things the stresses change, and getting in or out of the rotating structure starts becoming a challenge. Again though, artificial gravity has not been talked about for the DSH, so this is not the right thread to pursue this. I think its necessary to draw a distinction between different levels of spin gravity and the desirable outcomes at each level. Firstly as a matter of practicality it is good to have a minimum level. Enough so that liquids will settle and anything let go of will fall rather than float. This solves a range of practical and engineering issues. Not that you can avoid designing for zero g entirely but you can enjoy 'normal' life more. Showering, sleeping, eating etc. As well as the technical payoff, I think the benefits of having a sense of up and down haven't really been discussed much here. Those include the psycholgical and cognitive benefits. In short a spacecraft with a sense of up and down is more orderly and less stressful and people are less likely to be sick or suffer psycholigical issues. How much is enough? Perhaps 0.1g. Perhaps less. The point here is its not a big ask to implement. Then there is arguably a range of gravity that has a physiological impact. Forgetting about musculo-skeletal issues. We're talking about biological issues. Proper functioning of organs. Proper growth of tissue. Having liquids and gasses behave properly in the body. We don't know. My guess is that a modest level of spin gravity will make a big difference here. (And if it doesn't then we have serious issues with long term exposure to Mars gravity). So what are we talking about? 0.2g? 0.4g? Then there is musculo-skeletal issues. Clearly we are evolved for 1g and we will lose muscle and bone if not constantly stressed (physically). Again we don't know. We don't have the data on moderate lwvels of gravity. I would argue though that we can simulate these loads. And something no one here has picked up on is that in a space ship with modest spin gravity its a lot easier to do this. You don't need to be strapped into place with rubber bands. All you do is wear enough mass. Now you've got 1g equivalent loads but you have mobility. You can move around and actually do usefull stuff. Even if you prefer a VR environment this will help a lot and feel more believable/natural. The typical human would need about 110Kg of wearable mass in a 0.4g environment to simulate 1g. The other nice thing is your wearable mass could double as personal radiation protection (especially around vital organs). So my gut feeling (given the lack of comprehensive data) is for at least 0.2g of spin g and possibly as much as 0.4g (call it 0.38 or Mars g). Next you do not need this the whole trip. You can de-spin, reconfigure etc to suit the mission. There's no need for any moving parts. Possibly dockable parts. Since I've argued for a modest level of spin g it also follows that you do not need long structures. A structure that is 40m long rotated st 4.2rpm will deliver Mars equivalent g.
I'll also point out that a space habitat made of two identical units linked by a boom (transfer tube) has side benefits like redundancy and survivability in a crisis. Back to the argument about zero-g followed by high g landing on Mars. I still don't think this a good idea. Its all very well and good to quote trained cosmonauts. Its another dealing with civilians with varying degrees of fitness and underlying medical issues and adherence to exerecise regimes.. Even if you provide a modest 0.4g on the way I'm still no fan of hitting them with 4-6 gs on landing. Its one thing when you have the resources of Earth and a trained ground crew. Its another when you have no ground crew, you're in a hostile near vacuum environment, time is of the essence, you're weakened by the g forces and you're having to stretcher fellow passengers who are even worse off than you are. Thanks. I'll look into that. Test it with mice in centrifuge at 0.4G, in ISS? Testing on humans would deliver better quality science. Maybe we could tether a couple of Dragon/Orions and put a couple of crew in them for 1-2-3 month missions. Stick the whole thing a few Km awsy from the ISS as a backup. Even better, rigidly connect the capsules with a tube so they can paractice moving back and forth while spinning. Maybe we could tether a couple of Dragon/Orions and put a couple of crew in them for 1-2-3 month missions. I would argue though that we can simulate these loads. And something no one here has picked up on is that in a space ship with modest spin gravity its a lot easier to do this. You don't need to be strapped into place with rubber bands. All you do is wear enough mass. Now you've got 1g equivalent loads but you have mobility. That is so wrong. That does nothing for internal organs, brain, and the vestibular system. And it doesn't over the whole muscular skeleton system. There was an ISS component for producing centrifugal gravity on ISS, but the ISS is a micro gravity research lab. Pic The Centrifuge Accommodations Module (CAM). 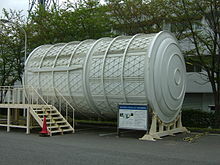 The partially constructed module is on display at the Tsukuba Space Center in Japan. In short a spacecraft with a sense of up and down is more orderly and less stressful and people are less likely to be sick or suffer psycholigical issues. What data are you basing this on? Based on what data? Also, why do you ignore the coriolis affect? •Not integrated in to Industry and NASA’s Cis-lunar exploration architecture. •AG offers the potential to address key Human Health and Performance needs for long-duration deep-space exploration. •Boeing has developed a number of enabling technologies to make this happen, including 9 AG patent pending concepts. •Currently performing ground-based studies to further inform our AG centrifuge system designs. Boeing is proposing a "Lab Module" for the ISS to evaluate AG technology - it will be interesting to see how they propose to isolate the vibration of the system, especially when they stop the centrifuge. I think you missed the point that you're starting with (notionally) 0.4g. The added mass is for the benefit of skeletal muscles. The basic gravity is for the other systems. The point about 0.4g is that whilst you could achieve higher whilst in transit, you're stuck with Mars g for much longer. In other words long periods of ~0.4g is a problem you just have to deal with. And if that's the case, why aim for 1g (or 0.8g or 1.2g - its a little arbitrary) whilst in transit? Globus and Hall write that rotations up to 10 rpm may be acceptable with training. If you only want Mars gravity for transit, 8.2 rpm would be fine. Nonetheless; they should strive to make any rotating artificial-grav structure large as practically possible, be it for testing or operational. I've already pointed out that there is an easy way to achieve a good radius. Build your habitat out of 3 pieces. Two identical modules docked to the ends of a transfer tube. In the Engle, Simon & Clark presentation above, they were able to crank the rpm tolerance up to 17RPM for the most queasy subjective after training, and they still retained their adaptation after 30 days. Why do you assume the FISO/Boeing concept isn't "as large as practically possible"? Given that "practical" and "possible" include things like cost, launch vehicles, likelihood of getting approval, logistics of mating with the larger station/vehicle, etc. Yeah, it's amazing how wrong we appear to have been on rpm tolerance. It's almost like we should being doing experiments in space to find the true limits.